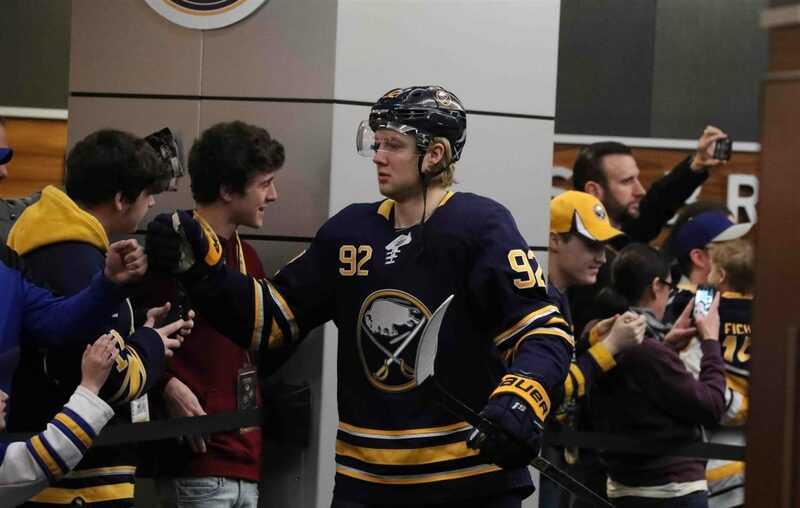 Alexander Nylander prepares to hit the KeyBank Center ice prior to Sunday’s game against Columbus (James P. McCoy/Buffalo News). Now, it's clear you can say that about a whole bunch of things when it comes to the Sabres these days. In this case, we'll stick to the club's player development theories. 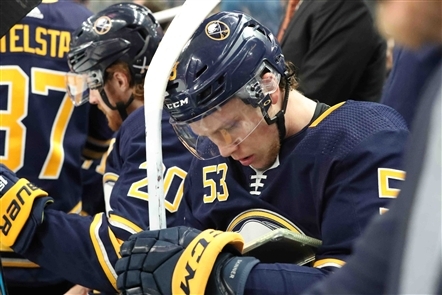 Injuries have largely necessitated some overdue callups from Rochester, so the Sabres' lineup now includes Victor Olofsson, Alexander Nylander, Will Borgen and Lawrence Pilut. In another week, when the NHL season mercifully ends, they'll be heading back down the Thruway to join their season-long teammates as well as Tage Thompson in the battle for the Amerks' first Calder Cup since 1996. As it turns out, the Amerks' playoff run is about the biggest thing the Sabres have going these days. Maybe it was their No. 1 objective all season. There's no reason why Nylander and Olofsson weren't here much sooner, no reason why Pilut wasn't here all season, and certainly no reason why Thompson was in the NHL until late March when he was clearly over his head at this level weeks ago. For this season, which completely crashed and burned the last two months, the Sabres look stubborn at best and pretty clueless at worst. They're hoping, of course, to see things in a long-term prism and derive maximum benefit from their decisions. We'll see next year how they turn out. For now, the Sabres can say Olofsson's three games thus far in the NHL are showing a full season in the AHL was to his benefit. Olofsson had a strong game in his debut Thursday against Detroit and scored his first NHL goal Saturday on Long Island. He wasn't as noticeable Sunday, with only one shot on goal while playing 17 minutes, 24 seconds. But it's tough to get open ice against Columbus, which has big mobile forwards and studs like Seth Jones and Zach Werenski on defense. "They are skill teams with good players and they made some good plays," Olofsson said of the Blue Jackets and New York Islanders. "If you give them anything, it's going to end up in your net. You have to manage the puck well. "You can make some plays starting in your own end and things can open up. But if you just start chipping pucks, lifting pucks in the neutral hard, it's sometimes hard to create scoring chances against them." The Amerks need to show some mettle in the postseason but it won't be easy with perennial rivals Syracuse and Toronto there to give them trouble. Imagine if Rochester flames out in Round 1 after the Sabres never used call-ups when they were still in the race — and don't get the kind of postseason success they've planned for in the AHL. Olofsson knows lots of organizational eyes will be on the prospects' run. "I just want to show that I'm ready for this level, so I get a good opportunity when I come into training camp to make the team right away," Olofsson said. "I've been getting the feel of the NHL. … They've got more skilled players. I want to bring that back to Roch, stay on this level and help the team there." The kids couldn't do much to prevent quite a stinker Sunday. With the loss closing March at 2-12-2, it was the Sabres' worst month since their epic 0-12 mark in January 2015, that highlighted the tank season. It was the worst March since a 2-11-1 stinker in 1996. Most of the crowd left for their second intermission break and stunning numbers of fans didn't return for the third period. Were there even 5,000 left in the building as the stragglers booed the final 30 seconds off the clock? With the team trailing after the second period, 4-0, and having been booed off the ice vociferously en route to falling to 1-12-2 in their last 15, the tone-deaf folks in game presentation put together a quick video montage for the second intermission. The music accompanying it? U2's "Sunday Bloody Sunday." I guess that's someone making a political statement there. Or perhaps looking to join Phil Housley on the unemployment line. Once the music stopped, Nylander didn't get much of a chance in the third period with the game out of hand. He didn't have a point for the fifth straight game and didn't have a shot for the second straight. Of course, it's tough to do much of anything when you're relegated to the fourth line with Zemgus Girgensons and Johan Larsson and play just 7:24 on the night. It's absurd. Nylander played three shifts totaling 2:13 in the third period. If Girgensons and Larsson are so terrible, and they mostly were Sunday, get Nylander to another line. Nylander should be used in a top-6 role to see if he can produce. That would have meant to put him Sunday with Skinner and Evan Rodrigues, and move Kyle Okposo down to play with Girgensons and Larsson. What's the point of having Nylander here otherwise? If you're not going to use him, send him back to Rochester on Monday and get him ready for the last week of the AHL season and the playoffs. "It wasn't so much Nylander," Housley said. "I just thought his linemates weren't feeling it tonight and obviously I thought the other lines were going, so I went mostly with the other lines." The other lines were going? Please. After Columbus toyed with the Sabres in the first period, the Jackets just kept things under wraps on the second half of a back-to-back that started Saturday in Nashville. This one was no contest. Run Nylander out there and see what he's got. What else is there to do in these games? It's just plain goofy. Like a lot of things are when it comes to this team.